Civil aviation is one of two major categories of flying, representing all non-military aviation, both private and commercial. Most of the countries in the world are members of the International Civil Aviation Organization (ICAO) and work together to establish common standards and recommended practices for civil aviation through that agency. Although scheduled air transport is the larger operation in terms of passenger numbers, GA is larger in the number of flights (and flight hours, in the U.S.) In the U.S., GA carries 166 million passengers each year, more than any individual airline, though less than all the airlines combined. Since 2004, the US Airlines combined have carried over 600 million passengers each year, and in 2014, they carried a combined 662,819,232 passengers. Private aviation includes pilots flying for their own purposes (recreation, business meetings, etc.) without receiving any kind of remuneration. 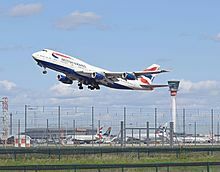 A British Airways Boeing 747-400 departs London Heathrow Airport. This is an example of a commercial aviation service. All scheduled air transport is commercial, but general aviation can be either commercial or private. Normally, the pilot, aircraft, and operator must all be authorized to perform commercial operations through separate commercial licensing, registration, and operation certificates. After World War Ⅱ, commercial aviation grew rapidly, using mostly ex-military aircraft to transport people and cargo. This growth was accelerated by the glut of heavy and super-heavy bomber airframes like the B-29 and Lancaster that could be converted into commercial aircraft. The DC-3 were also made for easier and longer commercial flights. The first commercial jet airliner to fly was the British de Havilland Comet. By 1952, the British state airline BOAC had introduced the Comet into scheduled service. While a technical achievement, the plane suffered a series of highly public failures, as the shape of the windows led to cracks due to metal fatigue. The fatigue was caused by cycles of pressurization and depressurization of the cabin, and eventually led to catastrophic failure of the plane's fuselage. By the time the problems were overcome, other jet airliner designs had already taken to the skies. Personnel licensing — regulating the basic training and issuance of licenses and certificates. Flight operations — carrying out safety oversight of commercial operators. Airworthiness — issuing certificates of registration and certificates of airworthiness to civil aircraft, and overseeing the safety of aircraft maintenance organizations. Aerodromes — designing and constructing aerodrome facilities. Air traffic services — managing the traffic inside of a country's airspace. The World Bank lists monotonously growing numbers for the number of passengers transported per year worldwide with a preliminary all-time high in 2015 of 3.44 billion passengers. Likewise, the number of registered carrier departures worldwide has reached a peak in 2015 with almost 33 million takeoffs. In the US alone, the passenger miles "computed by summing the products of the aircraft-miles flown on each inter airport segment multiplied by the number of passengers carried on that segment" have reached 607,772 million miles (978,114×10^6 km) in 2014 (as compared to highway car traffic with 4,371,706 million miles (7,035,579×10^6 km)). The global seasonally adjusted revenue passenger kilometers (RPK) per month peaked at more than 550 billion kilometres (3,700 AU) (~6.6 trillion per year, corresponding to roughly 2000 km per passenger) in January 2016, a 7% rise over one year. ^ "Air transport, passengers carried - International Civil Aviation Organization, Civil Aviation Statistics of the World and ICAO staff estimates". Archived from the original on 2017-02-04. ^ "Air transport, registered carrier departures worldwide- International Civil Aviation Organization, Civil Aviation Statistics of the World and ICAO staff estimates". Archived from the original on 2017-02-04. ^ "U.S. Passenger-Miles". Bureau of Transportation Statistics. Archived from the original on 2017-02-04. ^ "Press Release No. : 11 / Strong Passenger Demand Continues into 2016". IATA. 8 March 2016. Archived from the original on 4 February 2017.